This review of Canesten Clotrimazole Athlete’s Foot Cream was written in order to provide help to prospective customers, so that they can make the right decision when it comes to purchasing this product to treat athlete’s foot. Canesten Clotrimazole Athlete’s Foot Cream is used to treat athlete’s foot and is an anti-fungal cream. It contains the active ingredient clotrimazole, which is used to treat infections with fungi and yeasts. The product is not available on the manufacturer’s website but it is available in leading pharmacies and supermarkets. Read on to learn more about the feasibility of using this product to treat athlete’s foot. There is no description of the ingredients available on the product’s website but it contains Clotrimazole 10mg/g and 2% Benzyl alcohol as a preservative. There are no directions provided by the product’s website but a thin layer of the cream should be applied to the affected area two to three times daily and rubbed in gently. A strip of cream 0.5cm long is enough to treat an area of skin about the size of the hand. One should make sure to wash hands after applying the cream to avoid spreading the infection to other areas. Treatment should be continued for at least one month for dermatophyte infections and at least two weeks for candidal infections. To treat athlete’s foot you should make sure you wash and dry your feet, especially between the toes, before applying the cream. Irritation of the skin is possible. For example burning, stinging, itching, redness, rash, blistering or peeling. Stop using the cream and consult your doctor or pharmacist if you have a severe reaction to it. This product should not be used if you are allergic to any of its ingredients. Please inform your doctor or pharmacist if you have previously experienced such an allergy. If you feel you are having an allergic reaction, stop using this cream and inform your doctor or pharmacist immediately. Pregnant women and breastfeeding mother should note that this product will not be significantly absorbed into the bloodstream from the skin and it is highly unlikely that any of the cream will pass into breast milk. However, as with all medicines, you should seek medical advice from your doctor or pharmacist before using this supplement if you are breastfeeding. If you do use this medicine while breastfeeding you should not apply it to the breasts before feeding your baby, to avoid it being accidentally ingested by the nursing infant. The price of this product is $12.99. There is no guarantee being offered by the manufacturer but there is a customer care number which has been provided on the website if one has any issues or queries regarding the product. There are no customer reviews available to help potential customers make a decision. 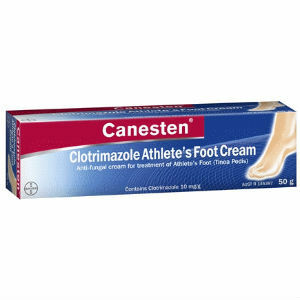 Canesten Clotrimazole Athlete’s Foot Cream has been described by its manufacturers as being an effective cream to treat athlete’s foot and gives a detailed description on how to use the product. It informs the customers about the effectiveness of the ingredient clotrimazole in treating infections. However, there are no customer reviews of the product, and no list of ingredients has been provided except for the two base ingredients. Moreover, there is no manufacturer’s guarantee and therefore it makes the product less viable in comparison to other products available for treating these kind of skin infections. There are warnings regarding the side effects caused by certain ingredients in the product and pregnant women and nursing mothers are advised to consult a doctor before using this product. Jimmy Rodriguez	reviewed Canesten Clotrimazole Athlete's Foot Cream	on November 19th	 and gave it a rating of 2.5.